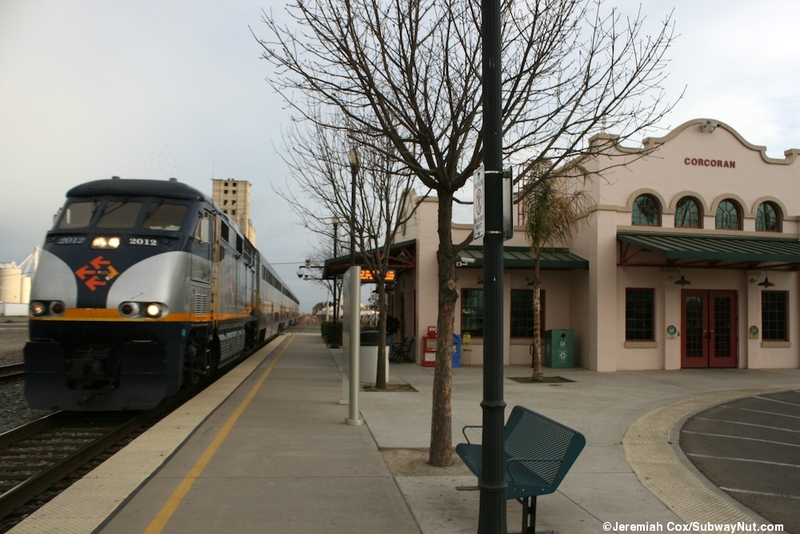 All reserved San Joaquin Trains make six daily round-trips from Bakersfield, four run to Oakland (OKJ) and two run to Sacramento (SAC). Each service makes 11 of its own unique intermediate stops (on stations are ever bypassed), with 12 total for the Sacramento branch and 14 for the Oakland branch. Trains consist of 3 or 4 California coaches (owned by CALTRANS, not Amtrak) plus a Cafe car. California Cars are modern bilevel cars (delivered starting in 1995) based on a Superliner with most seating upstairs (half forward and half backwards), two-by-two seats have tray tables, sets of four have actual tables and ADA seating downstairs. There is a line of a single power outlet per window seat. Each car has two automatically operated (compared with one on a conventional Superliner) doors that align with every station's (except for Stockton/Downtown) long 8' high concrete platform for level boarding for every door. There are also two staircases upstairs. 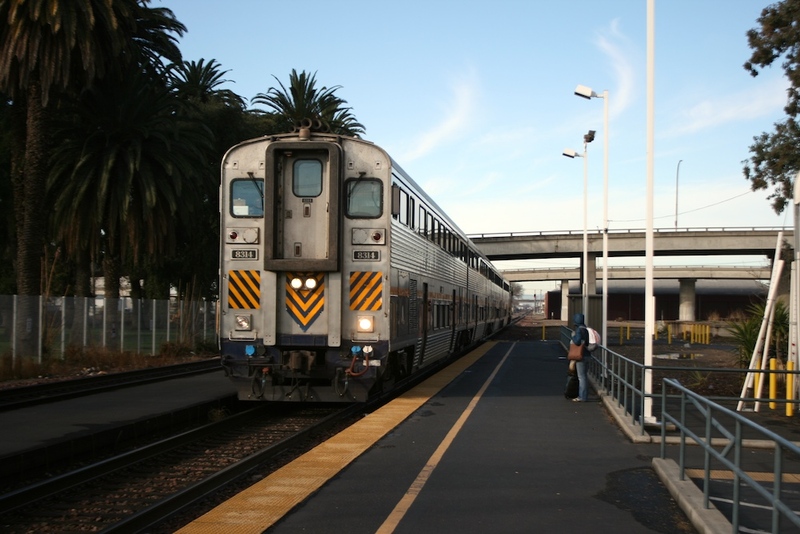 Every train has at least one car (when a Superliner is used the bags are left in public view) with a secure baggage area (only one door is for passenger use) and baggage service is provided for all trains at all staffed stations (baggage can even be checked through to southern California like Los Angeles or points farther south via a Thruway bus). All trains run in push-pull mode with either a California-owned F59PHI or P32-8 or a standard Amtrak P42. The locomotive is always on the northern end of the train, a California Cab-Car on the southern end. Recently California funded rebuilding a few recked Superliners and a single one of these cars now sees service on most trains, these cars are unique with a high density seating layout (of 96 conventional Amtrak seats, instead of 74 for a long distance Superliner) and have half the seats facing each direction with even four around a table opposite the staircase. The Superliner doors since manually operated are not opened at most stations. This car lacking the opening door is generally the most empty of the train although the lighting is noticeably darker. The rolling stock is entirely shared with the Capital Corridor. The cafe car of every train takes up the entire car with table seating and a counter that is even upstairs (the lower level is not open to the public and the doors never open). The menu is unique (compared to east coast cafe cars) and has selections like surprisingly good microwaved tacos and burritos. Under state law unboxed bicycles can be brought on board on trains unreserved housed in bike racks in many cars (the racks are even convertible so some are used as bike racks on the more biker used Capital Corridor and luggage racks on the more luggage-heavy San Joaquin trains). 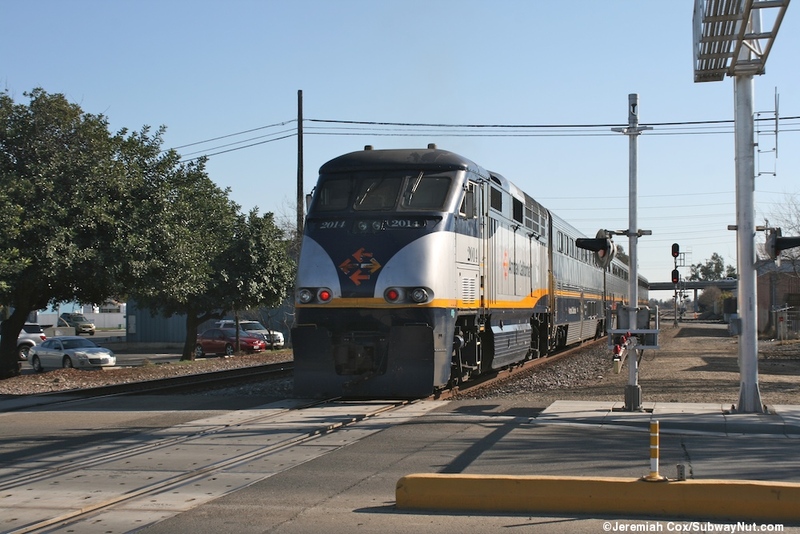 Service is scheduled in a way that requires six trainsets for normal operations, each makes a full daily round-trip although these are rotated through and shared with the Capital Corridor so all trains routinely visit the Oakland maintenance shop. 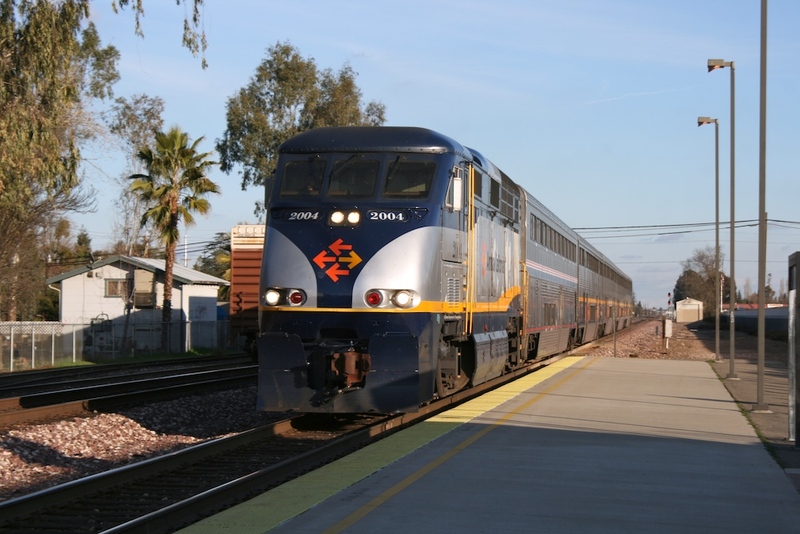 Many passengers only use the train for part of their trip taking advantage of motorcoach connections that allow travel to and from almost anywhere in the state of California. These coaches are a mix of Amtrak California branded buses and random white modern charter buses. 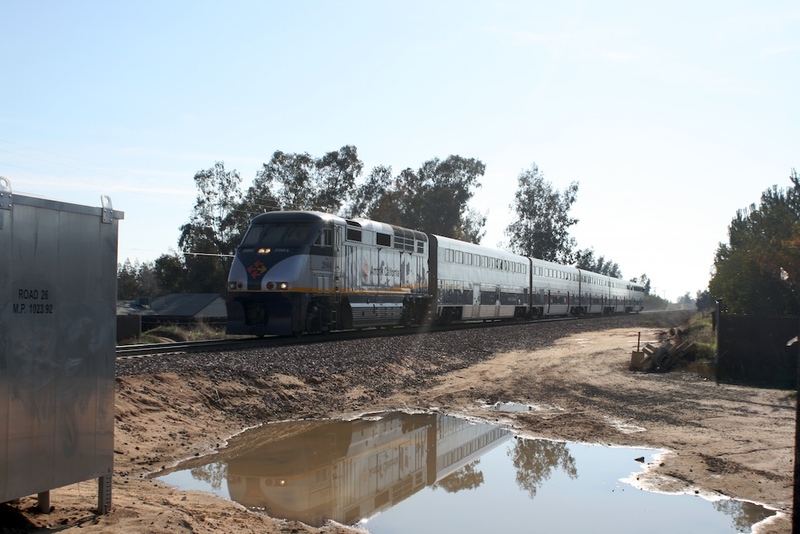 The most significant connecting point is Bakersfield where about five buses meet each train connecting passengers to numerous Southern California destinations such as Los Angeles (including onward connections via the Surfliner to San Diego). The other significant transfer point is Stockton where each station (the Sacramento branch serves the downtown station, Oakland the main San Joaquin Street station) offers bus connections to the branch the train isn't serving as well as down the Altamont Pass to San Jose and other northern California destinations. All of these buses even require a train ticket to ride (at least somewhere in your reservation, going one way by bus and back by train is allowed) because of state laws and all destinations are guaranteed for seamless travel. A direct ticket can even be purchased to Yosemite National Park connecting to YARTS at Merced. The entire Amtrak California network and the San Joaquin in particular is a model for how other states (and with enough investment perhaps the whole country) can have excellent intermodal transit options to reach a huge verity of destinations. Riding the train through it is surprising how many passengers are using the service just for short distance trips between the cities and towns within the San Joaquin Valley or to get from Stockton to the Bay Area. The corridor began operations on today's BNSF Route that skirts around more cities than it goes through compared to the competing SP route through the San Joaquin Valley in March 1974 with one partially California funded round-trip between Oakland and Bakersfield. 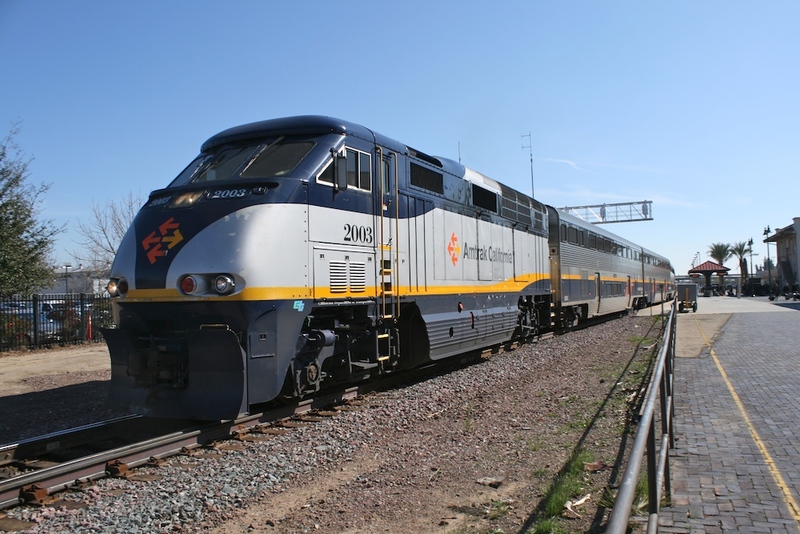 The train replaced the San Joaquin Daylight that ran until the advent of Amtrak in 1971 via the Southern Pacific Route via the San Joaquin Valley. Onboard service was a Diner-Lounge Car and coaches using Heritage Equipment. In October 1976 ("Amtrak Will Introduce New Rail Cars" L.A. Times October 18, 1976, Link) the train became an Amfleet Service with those nearly brand-new Amfleet-I cars with Tray Meal and Beverage Service in the Amdinette. This also resulted in the loss of a baggage car and all checked baggage service (that wasn't reinstated until the 1990s). Funding for Amtrak was robust in the 1970s and the state managed to stop subsidizing the route and by 1977 the train became one of Amtrak's worst money losing short-distance routes proposed for discontinuation (George L. Baker, "McFall stance encouraged San Joaquin train service cutback" The Modesto Bee, Aug. 11, 1977, Link). The front page of the Modesto Bee from February 1, 1979 (Link) shows a F40 stopped at Riverbank (Modesto) with two Amfleet coaches (one a food service car). The October 1979 timetable has a dreary note that "the continue operation of the San Joaquin is subject to pending litigation and/or state funding support." This is because of state litigation agains the San Joaquin cutbacks. The train was not discontinued in 1979, bailed out by the State of California Department of Transportation (who has subsidized it ever since) with specific requirements for better connecting bus service and lower fares to increase ridership ("San Joaquin train wins reprieve" Lodi News-Sentinel, September 1, 1979, Link) plus in 1980 a second daily round-trip was added to this Amfleet service. According to the timetables by 1987 the Amfleets were replaced as it became an unreserved Hi-Level Coach Service train, using the ex-Santa Fe High Level cars and/or the Superliner-Is. Service improved with a third daily round-trip to Oakland added on December 17, 1989 (by 1989 also the timetables lose their references to Hi-Level Coach service, I assume the new Horizon coaches and Amfleets were being used again). (Link). Throughout the 1980s more connecting bus services to the two daily roundtrip train continued to be added as timetables show (some complete with a diagram showing all the connecting destinations via bus), these bus connections have really made the rail corridor so successful. The line changed from a minor two trains per day branch to real corridor in 1990 when Propositions 116 and 108 (bond-acts) were passed for to purchase the California Rail Cars and for track upgrades. A portion of the gas tax is also allocated for the California rail system allowing stable funding ever since. 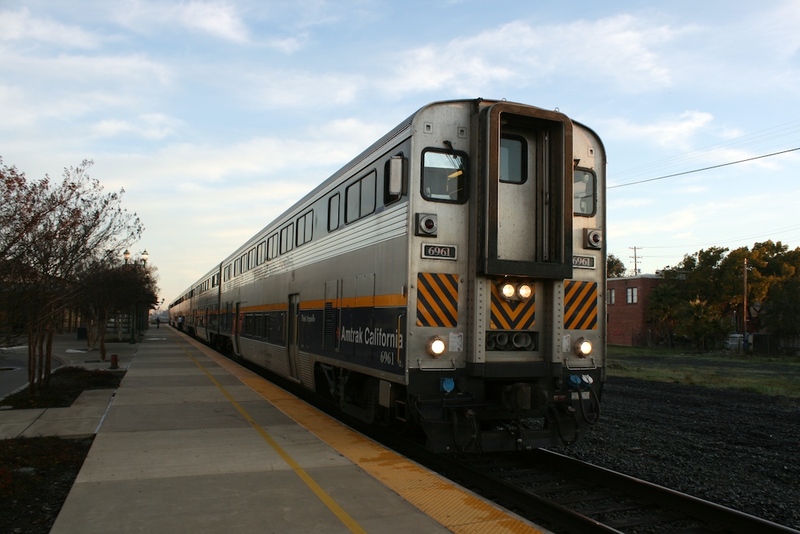 The current four Oakland to Bakersfield trips were reached in 1992 and in 1993 one train a day received baggage service, this was just a baggage car added to the regular train. It took until June 22, 1995 (Michael Cabanatuan, "Sleek Train Debuts It's Already Late but Earns Raves" the Fresno Bee, June 23, 1995 Link) for this train to receive the new California cars with their bike racks. From the October 1996 timetable two trains have bike racks (but only one receiving baggage car service), this can be interpreted as two daily round-trips (two total train sets) were using the new California Cars. The May 1997 timetable has all trains received baggage service and according to the notes about brining bicycles California cars were in use on 3 of the 4 trips. The October 1997 allows bikes on all trips meaning the corridor is fully using the new California BiLevel Cars. 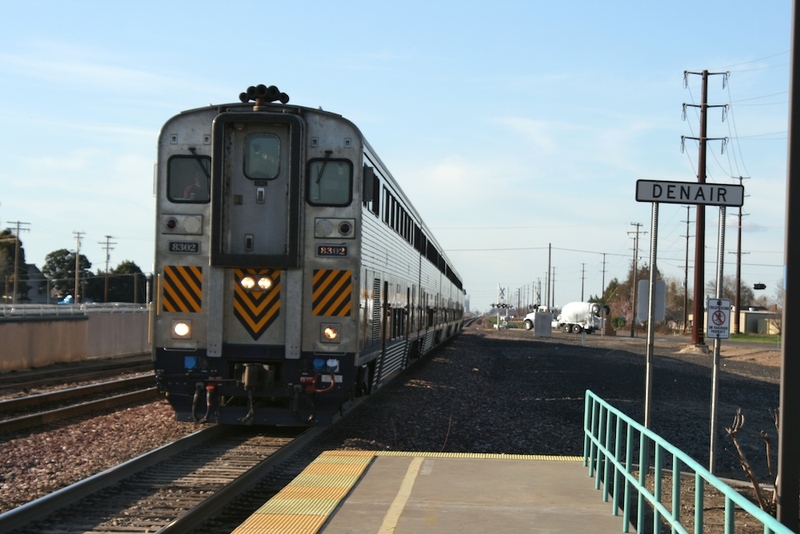 Service to Sacramento still hadn't begun yet and the first round-trip finally began in February 1999 when a track connection between the UP (ex-SP, the one railway up to Sacramento) and BNSF (used by Amtrak through the San Joaquin Valley) was finished. The second round-trip to Sacramento was finally added in March 2002, giving it todays service that served over a million riders for the first time last year (fiscal year 2010-2011), a far cry from only 7,000 persons per month when the corridor was almost discontinued in the late 1970s. If the California High-Speed Rail Line ever pans out it will basically follow the San Joaquin route through the San Joaquin Valley with high speed rail service through the mountains and south to Los Angeles and San Diego.